We will be opening the church each night this week from 6 - 7 for you to come and pray. And Friday we will have our Worship and Prayer Service. 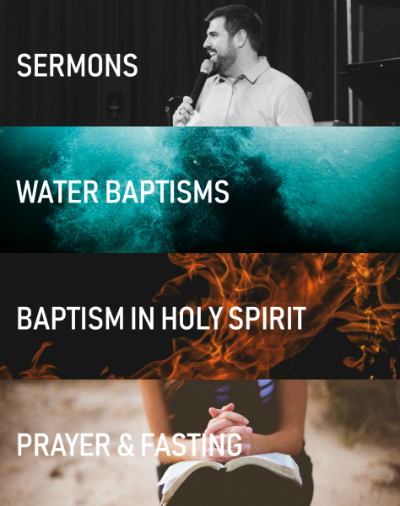 Whether you are joining us for a church wide call to Prayer and Fasting, or are exploring fasting on your own, we want you to be encouraged and equipped. Click through below to read more about why we value fasting and what fasting is. ​You can also click the link below to download a print friendly version of the information on this page. ​Biblical fasting is giving up specific food and drink for a specified number of days for a specific purpose. The type and length of the fast you choose is between you and God, and should not be determined by what anyone else is doing. Fasting, prayer and reading God’s Word go hand in hand. When you fast, also pray for God’s purpose and plan for your life to be revealed. Fast and pray about every major decision in your life. Simply put, fasting is a way to conquer the physical and open the door to the supernatural in your life. When you deny your body, you feed your spirit and grow closer to the Lord. what does the bible tell us to fast? In Matthew 6, Jesus gave us specific direction on how to live as a child of God. That pattern addressed three specific duties of a Christian: Giving, Praying and Fasting. Jesus said, “When you give”. . .“when you pray” . . . “when you fast.” He made it clear that fasting, like giving and praying, was a normal part of Christian life. Drink only liquids – especially water. On this type of fast you may also take in clear broth and 100 percent fruit and vegetable juices in order to maintain your strength. You establish the number of days for your fast in your prayer time. Daniel Fast: The most frequently used example of a partial fast is found in Daniel chapter 10. The Daniel Fast is a fast from meats, sweets, breads and any drink, except water, for a specific time period (Daniel 10:2-3). The easiest way to think of this fast is eating only vegetables and fruits, and drinking only water. ​Give up one item of food or drink such as caffeine, coffee, soft drinks or sweets give up one meal a day for a specific amount of time, one meal a week, etc. fast for a specific number of days. . . one day, three days, so on. ​Choose to fast from 6 a.m. to 3 p.m. or from sun-up to sundown. When doing this type of fast, consider your work and sleep schedule. The hours that you sleep should not be considered part of your fasting period, so the timeframe for this type of fast may vary. Q: What if I have a medical condition? If a health condition prohibits you from fasting food, try fasting something else and concentrate on prayer and Bible study. God knows your heart. Q: I forgot and ate something that wasn’t on my fast; do I need to start again? No, think of fasting as a marathon, rather than a sprint. Don’t give up! If you fall down, get up and keep trying. Conquering “king stomach” is difficult, but you’ll make it. Q: Do I continue to exercise while fasting? For most people moderate exercise is OK. But it is best to always consult a doctor about fasting and exercise. If you are on a complete fast, you may not have the energy for exercise. Q: What if I have a manual labor job? If you have a job that requires you to expend a lot of physical energy, you may want to consider a full fast for one to three days or make your fast a partial fast that allows you to receive enough nutrition to perform your job. Fasting involves a spiritual commitment to God. Be clear and follow the guidelines of your commitment. “Daniel purposed in his heart that he would not defile himself ” (Daniel 1:8). Before beginning a fast, write down a plan and make a verbal commitment to the Lord. When you approach your fast with determination and a clear goal, you will be less likely to waiver in weak moments. ​Are you in need of healing or a miracle? ​Do you desire to know God’s will for your life?